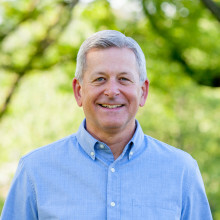 Mark Prater has served as an elder at Covenant Fellowship Church since 2002. In 1996, he led a church-planting team to Pittsburgh in order to begin Providence Church, where he served as senior pastor until 2002. Mark is the Executive Director of Soveriegn Grace Churches. Mark and his wife, Jill, have three married daughters and a growing number of grandchildren. They make their home in West Chester. Mark loves spending time with his wife Jill and they love getting as much time as they can with their grandkids, especially at the beach.